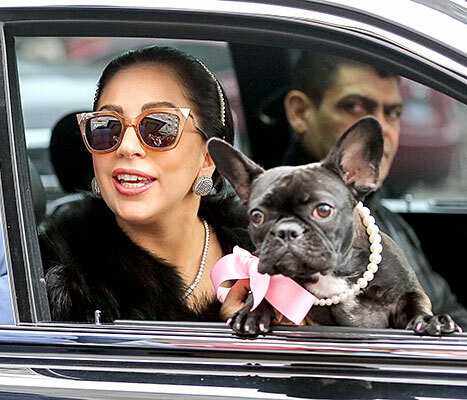 Lady Gaga’s Dog Miss Asia Is the Star of Coach’s New Campaign: Three More Times the Pup Stole the Spotlight! Oh, no you didn&apos;t, Miss Asia! Once again, Lady Gaga&apos;s adorable French bulldog, Miss Asia Kinney, has stolen the spotlight from her platinum-selling artist of a human—and frankly, it&apos;s just as adorable as every other time she&apos;s done it! PHOTOS: Stars and their pets! Feast your eyes on Miss Asia&apos;s new ad campaign for Coach. The four-legged beauty—who shares a last name with Gaga&apos;s fiancé, Taylor Kinney—gives good (and amazingly curious) face while sitting on a blonde lady&apos;s lap. She wears a bedazzled collar, while an eggplant-hued Coach handbag elegantly hangs from her furry body. Truth of the matter is, there ain&apos;t nothing she can do about it! Miss Asia has long been stealing the spotlight from her Lady—just check out these pictures for proof. 1. That time Miss Asia stepped out with her mama in matching pink tees. 2. Miss Asia takes private car service, thank you very much. She also rocks the best pearl necklaces—and the best nail polish! In short, Miss Asia is the cutest scene-stealer of our time.